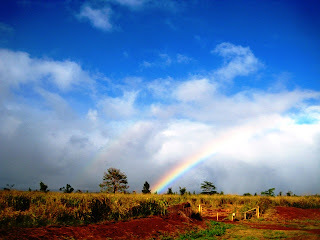 On Friday, October 28, 2011, I attended Pauahi’s Land Legacy huakaʻi in Paʻalaʻa, Waialua. We were fairly warned . . .
slippery stream crossings, loose gravel, slick mud, and cliffy sections. This trail has an elevation gain of 200ft. thus all hikers must be able to traverse up and downhill sections. This trail is not suitable for the elderly or people with: hip and/or knee ailments; vertigo; or an extreme fear of heights. This trail has many stream crossings - YOU WILL GET WET. And yes, we did get wet. We crossed the stream a total of six times; at one point it was almost hip deep. The amazing opportunity helped me gain a deeper understanding of how KS is changing from an absentee land-owner to one that is active and participatory. Currently the 10,000 acres of agriculture land is devoted largely to seed-crops, but plans are underway to start food crop production. Located up mauka, an additional 13,000 acres is conservation land, as wild as it can be. We started our day riding in the rip-snortingly fun Pinzgauers, German military all-terrain vehicles. Every KS employee had a mile-wide grin plastered across their face for this portion of the excursion. 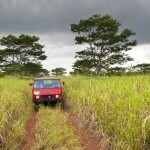 We were able to see the crop land and could rapidly gain access to the high-country using these fun vehicles. Our hike was about three hours of educational exercise. It was amazing seeing koa trees and learning about both native and non-native species. What was most striking was standing in the understory and looking up, knowing that almost every species we could see was invasive and pretty destructive. It was difficult to imagine what it looked like prior to the introduction of cattle and all the flora and fauna that accompanied them, plus other species that have arrived in the blink of time. The delicate Hawaiian ecosystem just cannot withstand the onslaught of new species. Our guides were excellent, a wealth of knowledge and I came away with a much deeper understanding for the 'aina and KS's role in working with not only this 23,000 acres, but with all the aina I could see from where we stood. It was an excellent opportunity and I urge others to participate if at all possible!